Wednesday 7th - Sunday 11th August 2019 . Festival ticket with camping for persons aged 8+ years. Access to campsites from Wednesday 7 August. Campers can arrive on either Wednesday or Thursday. This ticket includes £10 redeemable litter bond. More info here You will be charged an initial payment of £30 followed by equal installments between the month of purchase and Friday 27th July 2019. After your initial £30 payment, additional payments will be automatically debited from your account on the last working day of each month. Payment 2 - £49.66 to be taken 26/04/2019 Payment 3 - £49.66 to be taken 31/05/2019 Final balance - £49.38, postage and £10 litter bond to be taken 28/06/2019 Your final payment will also include postage and a £10 litter bond (per ticket). Please be aware that should you fail to pay the full balance you will NOT receive a refund and there will no longer be a festival ticket secured for you. Wednesday to Monday festival ticket with camping for persons aged 7 and under. More info here Child tickets can only be booked in conjunction with a full adult ticket. A maximum of 4x tickets can be booked in conjunction with a full adult ticket. Adults aged 18+ can accompany a maximum of two children under the age of 16. adults aged 24+ can accompany a maximum of four children under the age of 16. Weekend VIP Payment Plan: Wednesday to Monday festival ticket for persons aged 8+ with VIP camping, access to the VIP area and bar (mainarena) and car parking (1 x vehicle pass per transaction). More info here You will be charged an initial payment of £30 followed by equal installments between the month of purchase and Friday 27th July 2019. After your initial £30 payment, additional payments will be automatically debited from your account on the last working day of each month. Payment 2 - £75.00 to be taken 26/04/2019 Payment 3 - £75.00 be taken 31/05/2019 Final balance - £75.00 plus postage and £10 litter bond to be taken 28/06/2019 Your final payment will also include postage and a £10 litter bond (per ticket). Please be aware that should you fail to pay the full balance you will NOT receive a refund and there will no longer be a festival ticket secured for you. 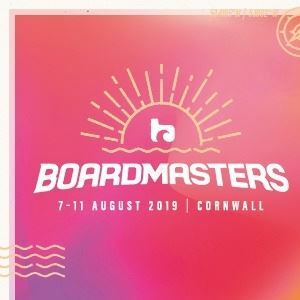 Wednesday to Monday festival ticket for persons aged 18+ with VIP Camping, access to the VIP area and bar (main arena), unlimited use of the festival shuttle bus, a free Boardmasters t-shirt, priority access to all Boardmasters after parties and VIP Car Parking (1 x vehicle pass per transaction). This ticket includes £10 redeemable litter bond. More info here You will be able to pay off the remaining balance of £340 plus postage andthe £10 Litter Bond (per order) any time before midnight on Friday 28th June 2019. Please be aware that should you fail to pay the balance by this date you will NOT receive a refund and there will no longer be a festival ticket secured for you. Charger Payment Plan: Wednesday to Monday festival ticket for persons aged 18+ with VIP Camping, access to the VIP area and bar (main arena), unlimited use of the festival shuttle bus, a free Boardmasters t-shirt, priority access to all Boardmasters after parties and VIP Car Parking (1 x vehicle pass per transaction). More info here In total you will pay the same value as the full price Charger ticket You will be charged an initial payment of £30 followed by equal installments between the month of purchase and Friday 27th July 2019. After your initial £30 payment, additional payments will be automatically debited from your account at the end of each month. Payment 2 - £113.33 to be taken 26/04/2019 Payment 3 - £113.33 to be taken 31/05/2019 Final balance - £113.34, postage and £10 litter bond to be taken 28/06/2019 Your final payment will also include postage and a £10 litter bond (per ticket). Please be aware that should you fail to pay the full balance you will NOT receive a refund and there will no longer be a festival ticket secured for you. Wednesday to Monday festival ticket with VIP camping for persons aged 7 and under. More info here Child VIP tickets can only be booked in conjunction with a full VIP adult ticket. A maximum of 4x tickets can be booked in conjunction with a full adult ticket. Adults aged 18+ can accompany a maximum of two children under the age of 16. adults aged 24+ can accompany a maximum of four children under the age of 16. Friday - Sunday no-camping ticket for persons aged 7 and under, allows entry into the main arena only. More info here Child tickets can only be booked in conjunction with a full adult ticket. A maximum of 4 x tickets can be booked in conjunction with a full adult ticket. Adults aged 18+ can accompany a maximum of two children under the age of 16. adults aged 24+ can accompany a maximum of four children under the age of 16. Friday festival ticket for persons aged 7 and under. More info here Child tickets can only be booked in conjunction with a full adult ticket. A maximum of 4 x tickets can be booked in conjunction with a full adult ticket. Adults aged 18+ can accompany a maximum of two children under the age of 16. adults aged 24+ can accompany a maximum of four children under the age of 16. Saturday festival ticket for persons aged 7 and under More info here Child tickets can only be booked in conjunction with a full adult ticket. A maximum of 4 x tickets can be booked in conjunction with a full adult ticket. Adults aged 18+ can accompany a maximum of two children under the age of 16. adults aged 24+ can accompany a maximum of four children under the age of 16. Sunday festival ticket for persons aged 7 and under. More info here Child tickets can only be booked in conjunction with a full adult ticket. A maximum of 4 x tickets can be booked in conjunction with a full adult ticket. Adults aged 18+ can accompany a maximum of two children under the age of 16. adults aged 24+ can accompany a maximum of four children under the age of 16. Friday VIP festival ticket for persons aged 7 and under with access to the VIP area and bar (main arena). More info here Child tickets can only be booked in conjunction with a full adult ticket. A maximum of 4 x tickets can be booked in conjunction with a full adult ticket. Adults aged 18+ can accompany a maximum of two children under the age of 16. adults aged 24+ can accompany a maximum of four children under the age of 16. Saturday VIP festival ticket for persons aged 7 and under with access to the VIP area and bar (main arena). Child tickets can only be booked in conjunction with a full adult ticket. A maximum of 4 x tickets can be booked in conjunction with a full adult ticket. Adults aged 18+ can accompany a maximum of two children under the age of 16. adults aged 24+ can accompany a maximum of four children under the age of 16. Sunday VIP festival ticket for persons aged 7 and under with access to the VIP area and bar (main arena). Child tickets can only be booked in conjunction with a full adult ticket. A maximum of 4 x tickets can be booked in conjunction with a full adult ticket. Adults aged 18+ can accompany a maximum of two children under the age of 16. adults aged 24+ can accompany a maximum of four children under the age of 16. Located in the Greenfield eco campsite you can reserve your 4m x3m camping spot wich will fit a pop up or small tent. Just bring along your tent and your pitch will be marked out ready for your arrival. More info here * Please note that a festival camping entry ticket must also be purchased for each guest, and it does not include a tent. Located in the Greenfield eco campsite you can reserve your 6m x4m camping spot wich will fit a pop up or large tents like a bell tent or family size tent. Just bring along your tent and your pitch will be marked out ready for your arrival. More info here * Please note that a festival camping entry ticket must also be purchased for each guest, and it does not include a tent.